Brash Seattle cornerback Richard Sherman, who entered the national conscience with his post-game rant heard around the world after the NFC title game, said that Peyton Manning was the classiest person and player he has ever met and that he could learn a lot from him. 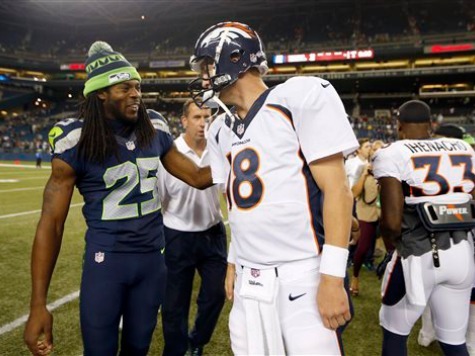 After a game in which Sherman took away one side of the field to help the Seattle defense smother Peyton Manning–and perhaps his legacy–en route to Seattle’s first Super Bowl win in franchise history, Manning still sought out Sherman after the game to ask Sherman about his health. Sherman left the game in the fourth quarter on a cart due to an ankle injury and had to return to the field in crutches. Sherman said he had the ultimate respect for Manning before the game and complimented him by saying even the “ducks” that Manning throws winds up with the intended target. That was an assessment with which Fran Tarkenton agreed. Sherman has been described as being Ray Lewis in the secondary, and Manning and Sherman’s “moment” was reminiscent of when Manning sought out Lewis last year after a heartbreaking Broncos loss in double-overtime to the Baltimore Ravens during what was Lewis’s last NFL campaign.